On the 2nd of November, 2015, AMD announced the replacement of the AMD Catalyst driver with a new "mini graphics operation system" they call the AMD Radeon Software. The first version will be called Radeon Software : Crimson Edition. We wrote about it in our Technology Report on the AMD Radeon Software : Crimson Edition. 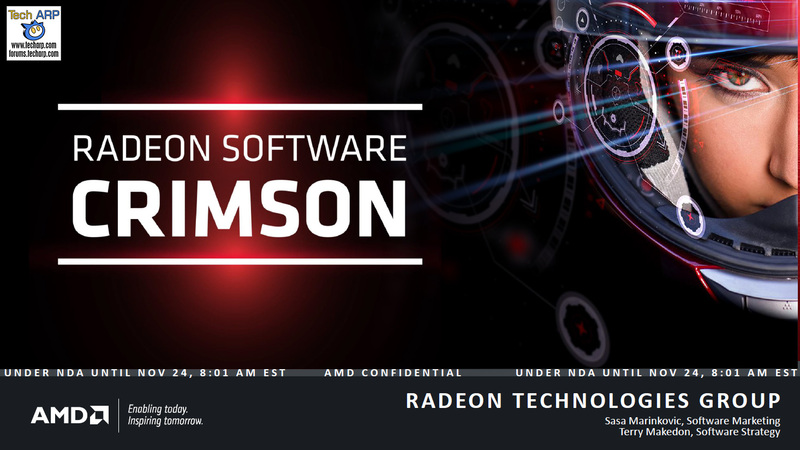 November 24, 2015 — AMD (NASDAQ: AMD) today released its completely reimagined graphics software suite, Radeon Software Crimson Edition, giving users an exceptional new user experience, 12 new or enhanced features, up to 20 percent more graphics performance, adjustability that can nearly double generational energy efficiency, and rock-solid stability across the full spectrum of AMD graphics products. The release is the first from the Radeon Technologies Group, which recently announced a renewed focus on software placing it on par with hardware initiatives. Radeon Settings – A new, streamlined user interface: Engineered to get the best performance on AMD graphics hardware, the user-friendly and feature-rich Radeon Settings is lightning fast, starting up 10 times faster and initializing displays 3 times faster than the AMD Catalyst™ driver. It also offers a more intuitive navigation, a new game manager, new overdrive, and new video, display and AMD Eyefinity technology sections letting users easily apply game settings, adjust performance settings, and apply various features and configurations to their computing experience. 12 new or enhanced features: A wide range of new and augmented capabilities help ensure that users enjoy the best experience possible across gaming, video and productivity applications. Supercharged performance and energy efficiency: Radeon Software Crimson Edition enables up to 33 percent faster game load times, up to 20 percent more game performance, and up to 1.8 times more energy efficiency capability than its predecessor which can increasing system performance-per-watt by as much as 23 percent. First public support of AMD LiquidVRTM technology: GCN’s Asynchronous Compute Engine helps to dramatically improve frames per second (FPS), responsiveness and latency in Virtual Reality applications for an exceptionally smooth gaming experience on all GCN-based hardware. Seamless stability: With twice the number of test cases across 15 percent more system configurations than AMD Catalyst™ Omega, and the implementation of a huge number of community-driven requests, Radeon Software Crimson Edition delivers exceptional stability across a range of experiences. Radeon Software Crimson Edition is available for free download today at http://support.amd.com/en-us/download. This is a video presentation of Terry Makedon from AMD's Software Strategy Team, and Sasa Marinkov from AMD's Software Marketing Team unveiling the key features of the Radeon Software Crimson Edition. It runs over 40 minutes long, so grab some popcorn and enjoy! For those who prefer to view the slides individually, here they are. 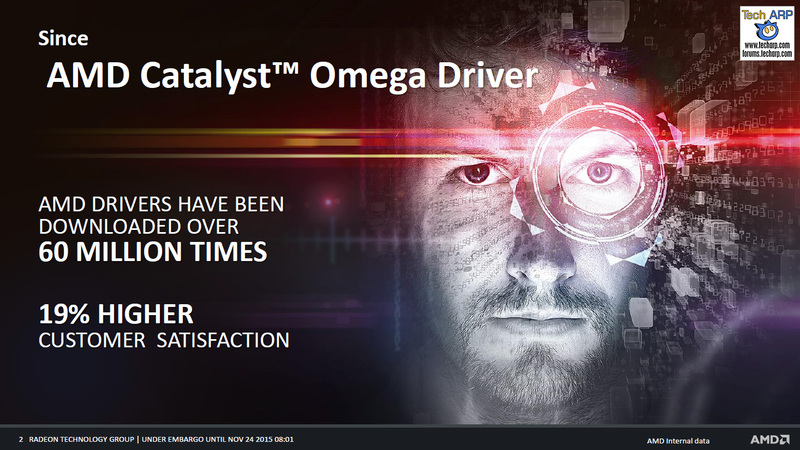 AMD started the briefing with a brief overview of their last major Catalyst driver - the AMD Catalyst Omega driver. That was last of the 3 major WHQL driver releases in 2015. 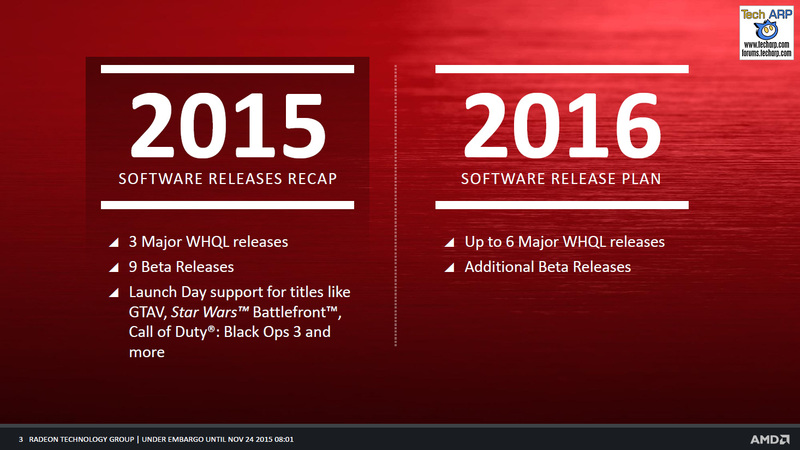 AMD knew that they were a little slow in this regard, so they aim to double the number of major WHQL releases in 2016.